Before I discuss tackle and tactics, I feel it’s necessary that I should first discuss the intended quarry. In military terms it would be described as ‘Know your enemy’ or in this case, know your sea trout! The more knowledge you have about your chosen quarry, the better prepared you’ll be to confront the quarry and succeed. I won’t dwell on the life cycle of the sea trout but instead discuss a general time frame that I have encountered regarding fish entering rivers over a typical season. The season in England & Wales starts the beginning of April generally and at this time there will more than likely already be fish in some river systems. These fish will in all likelihood be few in number, perhaps solitary and very difficult to locate. They will also be of a size that will make your eyes pop out! Through May and June, the quantity usually starts to increase but the size of fish starts to diminish. This is usually the 5 to 10lb class of fish. I can’t say that the big double figure fish stop running because there is probably a plethora of anglers that have landed large sea trout during the height of summer and will disagree with my previous sentence. However, I will add that the chance of catching a large specimen diminishes as more and more smaller fish enter the River systems. 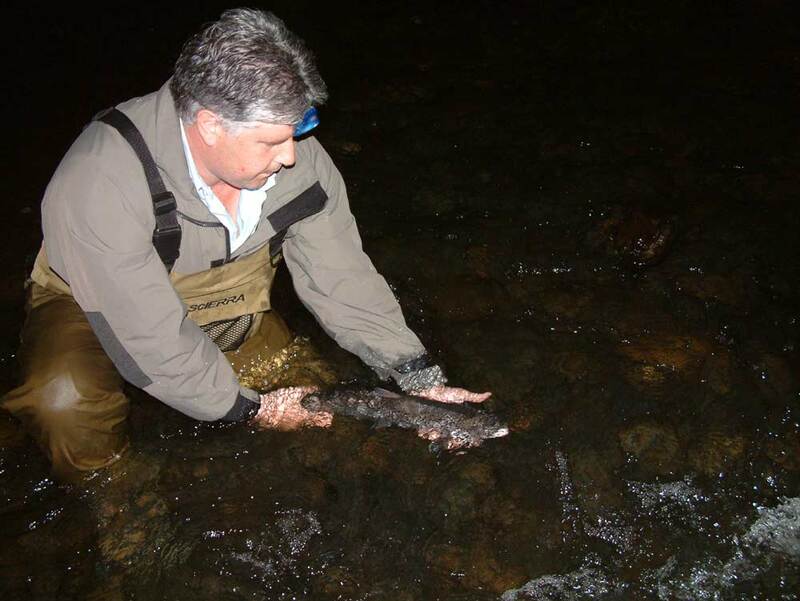 Usually around July and August we start to see large shoals of small sea trout arrive. These are the bread and butter fish that the majority of sea trout anglers, both dedicated and holiday anglers encounter. These fish can be anything from a few ounces up to 5lb in weight. 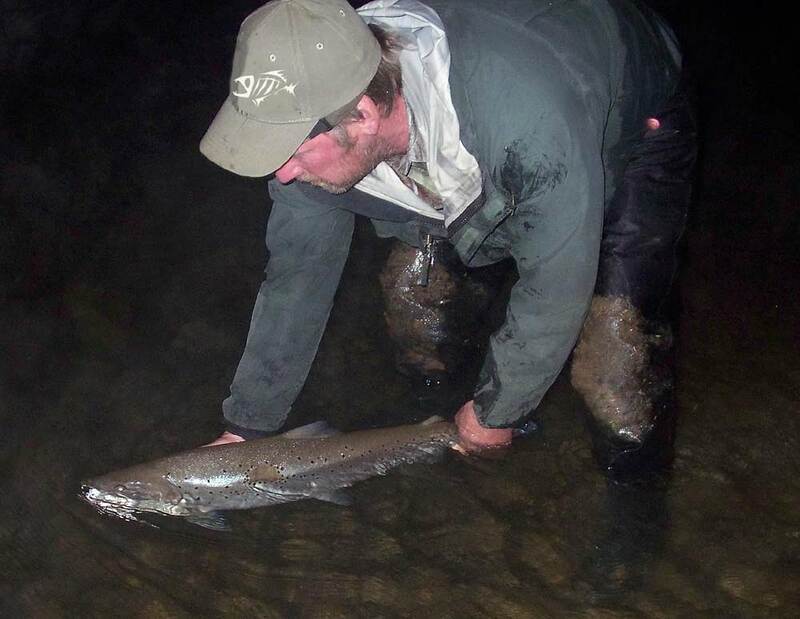 As the season draws to a close through September and into October, once again we will see the return of the larger fish desperate to get to the headwaters to complete their spawning duties. As I have mentioned, this is only a general guide. There are many other factors which govern when the sea trout run the rivers; tides, weather, barometric pressure, moon state. All will have some influence over their arrival. Consistent success will come only through good reconnaissance, spending time on the water and getting to know your venue. For many of you wishing to start, choosing a venue will be the biggest obstacle that you’ll probably encounter. As I have indicated in the previous paragraph, you can time your fishing to coincide with the time of year when the fish are about in numbers. Well the comment about knowing your sea trout also applies to knowing your venue. Sea trout are a fickle fish at the best of times, so trying your luck now and again will not bring results. To get the best out of any trip that you make to any venue, you will have to do your homework. This can be achieved in many ways. Should you go to the extent of taking a season ticket out with an angling club, speak to the Secretary and explain your situation, speak to the tackle shop proprietors before coming. This also applies if you are just on holiday for a short period of time. After all you will be giving them business so it is in their interest. Another excellent way to learn more about a venue is to participate in river cleanups or work parties that aim to improve facilities. Besides making new friends you will be helping the club and benefiting from other members experiences. It’s a strange thing that although sea trout anglers like to keep secrets from one another, when you get them on their favourite subject, sea trout, you won’t be able to shut them up! Ultimately though, to get the best from your chosen venue, you will have to spend a lot of time not just fishing but walking and looking to find fish. The choice of venue is a personal thing I believe. For some it’s geographical. But some venues have a reputation that is well deserved for both quantity and quality of fish that they produce. I wouldn’t like to produce a league table of ‘best’ sea trout Rivers’ for fear of offending anglers. After all, angling is about relaxation and not competition. But here in Wales we have some of the best sea trout fishing that can be found anywhere in the World. This is a personal thing. What’s one man’s meat is another man’s poison. I can only advise on what I use and my reasons for using it. Waders: I always wear chest waders. In fact I have two pairs that I use; a pair of neoprene waders that I use both early and late season and a set of breathable waders that I wear during the summer. In the early season, the water can be quite cold and the neoprene waders are very good at keeping you warm. This very advantage becomes a distinct disadvantage in the summer; hence the breathable waders. Wading Jacket/ Waistcoat: When I fish I tend to travel light and therefore never carry a tackle bag with me. Everything I need goes either goes into my waistcoat or pockets of my wading jacket. If the night is a bit chilly which can happen on a regular basis at the beginning and end of the season, I supplement my clothing by wearing numerous thin layers, made of cotton, with thermal sweatshirts and the like over. I always wear a hat regardless of the weather and I attach a headlamp that aids me getting in or out of difficult wading positions. Ancillary Items:I always carry enough tippet material in 12lb, 10lb and 8lb. Out of preference I use Drennan sub surface for no other reason than it hardly ever kinks and usually you will straighten a hook before it snaps! In addition to my headlamp I carry two other torches that have both been tested! A priest is essential as is a bag to keep your catch in. I carry a net and my spare spools for my fly reels. I also carry a good insect repellant; the midges can be murder in the summer! Rods: I use the term rods because on the one hand I fish different venues and on the other hand at different times of the season, I will fish different size flies that require a different AFTM rating. Let me explain. The rods I use are all from the G Loomis stable. They are light and have a fast action to them that suits my casting style. They are a 9ft 9” 3pce 8wt IMX Slate, a 10ft 2pce 7wt Loomis GLX and a 9ft 6wt Loomis GLX. In the early season casting is long and the flies I use are large aluminium tubes or Waddingtons. Now these flies don’t take kindly to being used on light rods and therefore I use the IMX Slate 8wt. As the season progresses and the river flows decrease, I will move down to the GLX 7wt, which still gives me the distance and gives me the sensitivity and presentation that I require when fishing smaller flies. It does get to the point at sometime in the season that a 7wt is too much rod for the river. At this point, particularly on a small river I will change down to my 6wt. In low water, it’s no good thrashing the water; that will only put fish down. Flies, flies, flies! Everyone always wants to know what flies did you catch the fish on! 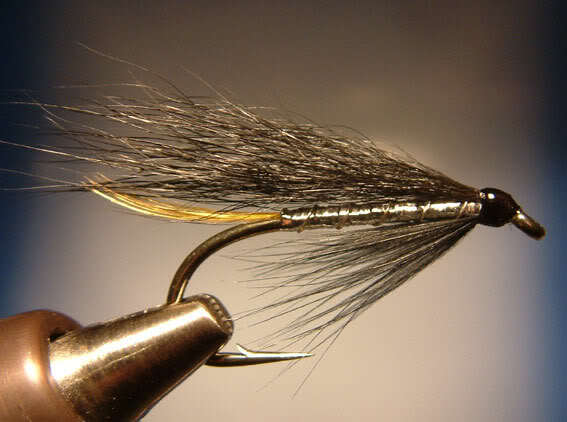 In sea trout fishing I feel that the size and style of fly you are fishing matters more than the actual pattern. I have spent many a night where one angler has caught on a surface lure, another on small flies and another on a large tube, all from the same stretch! However that said, you can maximise your chances by having a few stock patterns in your box that will catch fish almost anywhere. By tying them in a variety of styles and sizes you will be able to cover most eventualities. As ever, by actually fishing you will often meet up with anglers who might give you their killing flies that will then further enhance your fly box. The Alexandra: This without doubt comes top of the list. I have personally caught countless fish on this pattern. I wholeheartedly recommend it. The Silver Stoats Tail: This pattern like so many other Seatrout patterns contains the well-known combination of black and silver; killing combinations in any Seatrout fly. The Stoats Tail: Like it’s relative above it also incorporates black and silver. The subtle difference is that it has a black body ribbed with silver. For Seatrout that have been in the River a little longer a subtler and less flashy pattern usually works better. The Hair wing Butcher: This fly could be classed as a variant of the original butcher or a variant of the silver stoats tail. I’ll leave that to you to decide. However, this pattern is one of the most successful patterns I have used in recent years. In addition to that it has caught more Salmon after dark than any other fly I know of! Falkus Medicine: No Seatrout fly box would be complete without this excellent pattern. It is such a simple pattern to tie and yet is so effective in putting fish in the net. Like all things that are successful, they are always simple. When putting your fly box together, I would recommend that you tie the above patterns in a variety of sizes, low water salmon sizes 4-10, long-shank trout hooks sizes 4-10, doubles 6-10 and on aluminium tubes and Waddingtons of various sizes to suit your purposes. These are not hard and fast rules. As I have mentioned briefly it pays to match your tackle to the venue you fish. This also applies to the size of fly you fish; in faster water fish a bigger fly. The maxim I always use is that the bigger the water, the bigger the fly I use. Purchase a copy of Sea Trout Fishing by Hugh Falkus. Read it from cover to cover and then read it again! 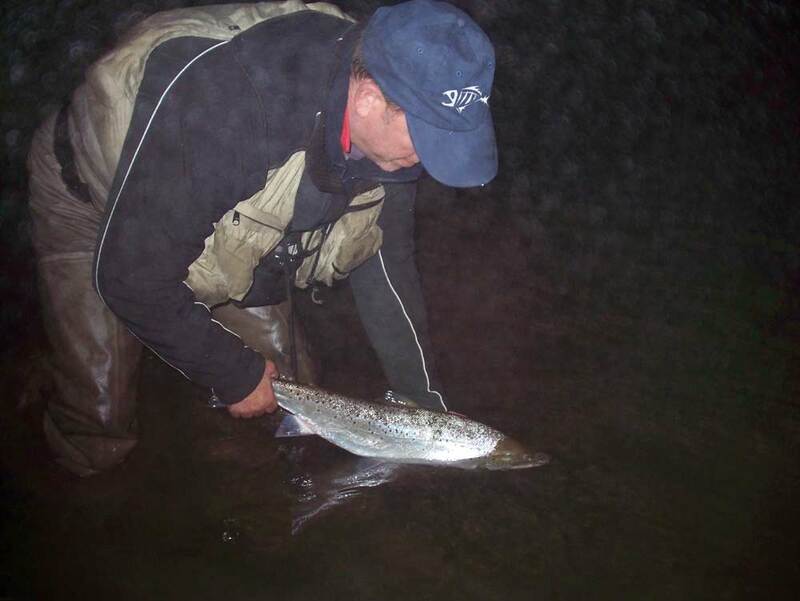 If you are intending to start sea trout fishing, decide on a venue and find out as much as you can. Try to get someone else involved. Apart from being company and sharing the learning curve, from a safety point of view, it’s essential. Before trying your hand at night fishing, fish your chosen venue in daylight. Things look VERY different at night. Fish with only one fly to prevent tangles until you feel competent enough to handle a dropper as well. When tying flies, use only the best hooks you can purchase. I recommend Partridge. Wear a life preserver at all times when fishing in a river, never take chances. The final point that is the most obvious but is most often overlooked, if you can go with someone who catches fish!!!!!!!! FishPal would like to thank Alun Rees for his contribution to the FishPal blog.